I first encountered John Steele Gordon in an excellent lecture of his that was adapted for Hillsdale College’s Imprimis Magazine. A born educator, Gordon is able to “bring alive” seemingly mundane history and tie diverse threads into a cord that tugs on one’s understanding of past–and current–events. 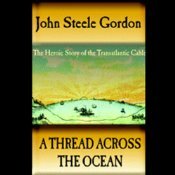 In “A Thread Across the Ocean,” Gordon introduces the characters, business principals, and technology involved in the mid-1800s effort to lay a telegraph cable across the floor of the Atlantic Ocean. The most notable character is Cyrus Fields. Despite repeated–and costly–failures, Fields did finally achieved a lasting connection in 1866. I listened to the Audible Books narrated version of this book. While the narrator, Scott Brick, was good, I do wonder if the author himself couldn’t have done even better. The importance of the corporation as a risk-reducing entity to encourage investment. The value of trial and error alongside careful planning and engineering. In unforeseen errors one learns WHAT needs to be engineered. The mutual benefit of private and public funding in large endeavors. When the British government learned that one timely communication (regarding deployment of troops) had saved it the better part of the money it might have spent on the transatlantic cable, it promptly invested substantial public money. But private investors made sure the project was profitable. The earliest steamships could not carry sufficient coal to power them on long voyages. Not until Isambard Kingdom Brunel launched the mammoth SS Great Eastern in 1858 was there a steamship large enough to efficiently lay the transatlantic cable.